Theoretical and Computational Aerodynamics. Tapan Sengupta K.. Скачать бесплатно книгу на сайте LiveLib - Лайвлиб. Theoretical and Computational Aerodynamics. Tapan Sengupta K.
Aerodynamics has seen many developments due to the growth of scientific computing, which has caused the design cycle time of aerospace vehicles to be heavily reduced. Today computational aerodynamics appears in the preliminary step of a new design, relegating costly, time-consuming wind tunnel testing to the final stages of design. 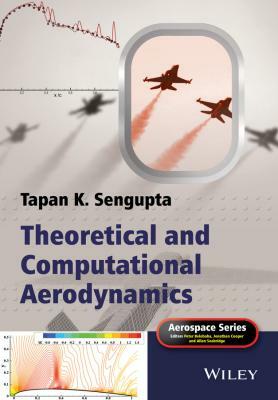 Theoretical and Computational Aerodynamics is aimed to be a comprehensive textbook, covering classical aerodynamic theories and recent applications made possible by computational aerodynamics. It starts with a discussion on lift and drag from an overall dynamical approach, and after stating the governing Navier-Stokes equation, covers potential flows and panel method. Low aspect ratio and delta wings (including vortex breakdown) are also discussed in detail, and after introducing boundary layer theory, computational aerodynamics is covered for DNS and LES. Other topics covered are on flow transition to analyse NLF airfoils, bypass transition, streamwise and cross-flow instability over swept wings, viscous transonic flow over airfoils, low Reynolds number aerodynamics, high lift devices and flow control. Key features: Blends classical theories of incompressible aerodynamics to panel methods Covers lifting surface theories and low aspect ratio wing and wing-body aerodynamics Presents computational aerodynamics from first principles for incompressible and compressible flows Covers unsteady and low Reynolds number aerodynamics Includes an up-to-date account of DNS of airfoil aerodynamics including flow transition for NLF airfoils Contains chapter problems and illustrative examples Accompanied by a website hosting problems and a solution manual Theoretical and Computational Aerodynamics is an ideal textbook for undergraduate and graduate students, and is also aimed to be a useful resource book on aerodynamics for researchers and practitioners in the research labs and the industry.